(Newser) – In what is not expected to be the last controversy of the Clinton campaign, heated discussion of her logo erupted on social media as soon as she announced her 2016 White House bid yesterday. 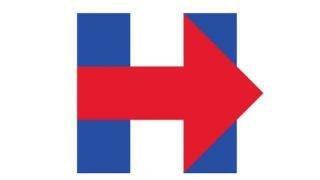 Some critics said the red-and-blue logo looked like it had been made in MS Paint and likened it to a road sign for a hospital, Mashable reports, while WikiLeaks accused her of ripping off its Twitter logo; others wondered if she had made off with the arrow from the FedEx logo. Many noted that the logo's arrow points right, which Tom McKay at Mic believes could be "a deliberate hint that Clinton's campaign strategy will focus on selling her as an easily palatable moderate rather than a firebrand progressive." If she was going to have this one, the arrow should be pointing the other way, as in go Left, not Right. :) But it does kind of look like, Hospital this way!